It was the morning of the race, and I awoke early, as I usually do for most races. I ate my breakfast, put my race gear on, and headed out the door. Last year I wore a tank top with a long sleeve shirt that was my throw away. But I never ended up throwing it away because it was cool and windy. This year I chose arm sleeves and a short sleeve shirt. You never know what the weather will be, but I wish I would have had my tank top on instead this year because it was much warmer. Last year I opted out from taking a water bottle and held my phone the whole time. This year I purchased a flip belt and was able to place my phone in there. So I decided to carry a small plastic water bottle (8oz) then I was just going to throw it away when I was done so I didn't have to hold it the whole time and I could just stop at water stops when I needed. Because Big Sur is a point to point race you need transportation to get to the starting line. I arrived, I thought in plenty of time, used the bathroom and got to the starting line. Of course my GPS wasn't picking up a signal, and it was time to start. I didn't even get to put my head warmer on yet. It took me close to two miles to finally pick up a signal on my GPS. Between doing that and putting my head warmer on, I realized that I lost two GUs that were in my arm sleeve. I thought this race is not starting out to a good start. I finally got my groove and felt good. I didn't know my time, of course, since my GPS watch was behind, but knew I was doing ok because I was right behind the pacer for the first 8 miles. Luckily I had two more GUs in my other arm sleeve. After taking one of them and rolling my arm sleeve down my other GU fell out. I did have one more in my flip belt but knew I would need that one later, so I took a few steps back to pick it up. By this time I lost track of the pacer, which is fine, so I thought well I'm just going to enjoy it and take some pictures. 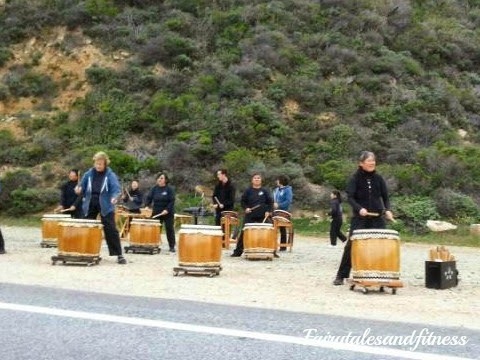 These drummers were at the bottom of mile 10 and they did help me get up that hill. While still climbing up the hill I couldn't pass up a perfect photo opportunity of the coast. 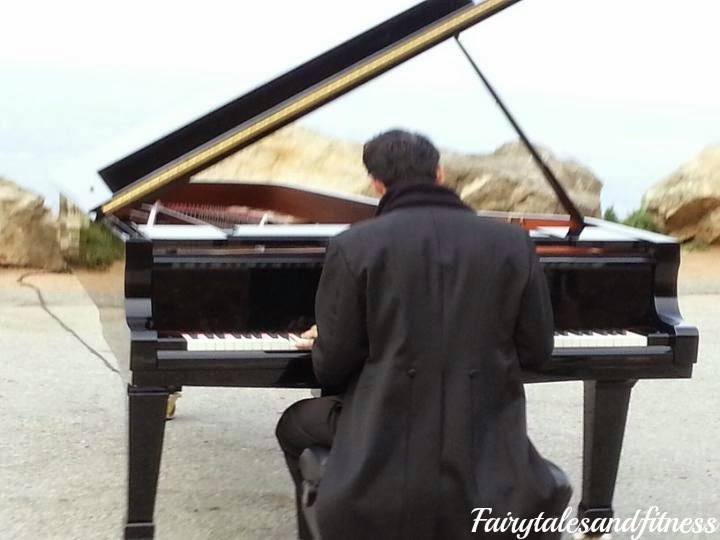 Then I was crossing the Bixby Bridge and taking a great photo of the pianist at mile 13. I did feel the first half of the race went by fairly quickly. We didn't even have any of that wind we hear about for Hurricane point. I remember last year the clock was set up to say what you're time was at the half way point. I was looking forward to seeing this since my watch was off. But when I got there, it said the time alright, it was the time of day. Later I asked the race director about that and he did say that it was an error and it should've said your time. Still not knowing my time, I just ran on how I felt. By this time I was stopping about every other aid station for water. I actually walked through them while taking water (which I normally don't do) But I have to say, I got all the water I needed at the time, instead of spilling it on me, and I did feel much better once I started running again. I knew the strawberry stand was at mile 23, it couldn't come soon enough! Last year there was a sign that said please only take one. Well this year I didn't see a sign so I took three. I will say that this year looked like they had plenty more than the time before. Maybe they were on short demand last year. Next came mile 24. Every mile marker there was a fun saying like, Sounded like a good idea at the time and What was I thinking? 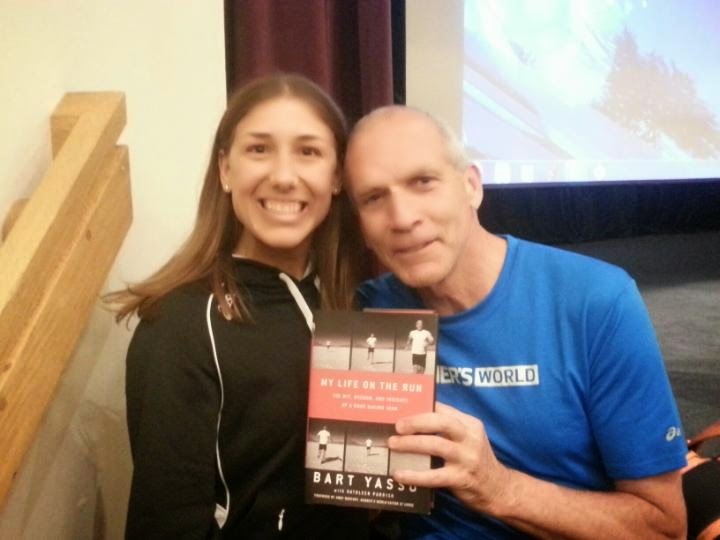 I remember at mile 24 Bart Yasso's picture was on the sign saying Pain is temporary but crossing the finish line is an accomplishment you will always have. After meeting him at the expo, I knew this would be something that he would say. It kept me going. Next it was the dreaded mile 25 that is straight up hill. I kept thinking get through this and then its a downhill stretch to the finish. While climbing up the hill, my quads were screaming. I just told them to shut up and keep going! I also remember when Dean Karnazes spoke at the expo and said when the going gets tough, I just put one foot in front of the other, and that's just what I did. After finishing mile 25, I tried to pick up my pace during the last mile and finish strong! It turned out to be a beautiful day! Even with my small mishaps in the beginning, the hard mile at 25, and taking pictures along the way, I only finished 5 minutes later than I did last year. That is just fine for me. I got some beautiful pictures along the way. I am grateful to have the pictures rather than a few minutes less on the clock because that's what you are going to remember. Did I mention this was the hardest marathon I have run to date? After crossing the finish line, I got right in line for a well deserved massage. These were complimentary (only ten minutes) but it was still nice. Then I headed over to the VIP tent for a great lunch and a glass of wine. P.S This is my bud Amanda. 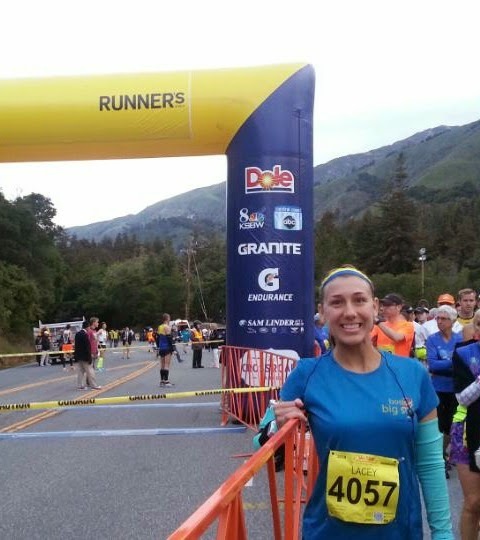 Big Sur was her first marathon and she rocked it at 3:39! What was the hardest race you've ever run? When I was planning my Disney wedding, it was not unusual for the brides to have something called a Dessert party on the days leading up to the wedding, or even sometime afterwards. These brides would have an area of Epcot roped of just for them and their guests. It was usually somewhere around the Lagoon so they would have a great view of Illuminations while being served delectable treats. As much as I love cupcakes, I did not have one of those Dessert Parties, although I always thought it would be pretty cool to have a portion of Epcot dedicated just to you and your guests. It sounded so exclusive! 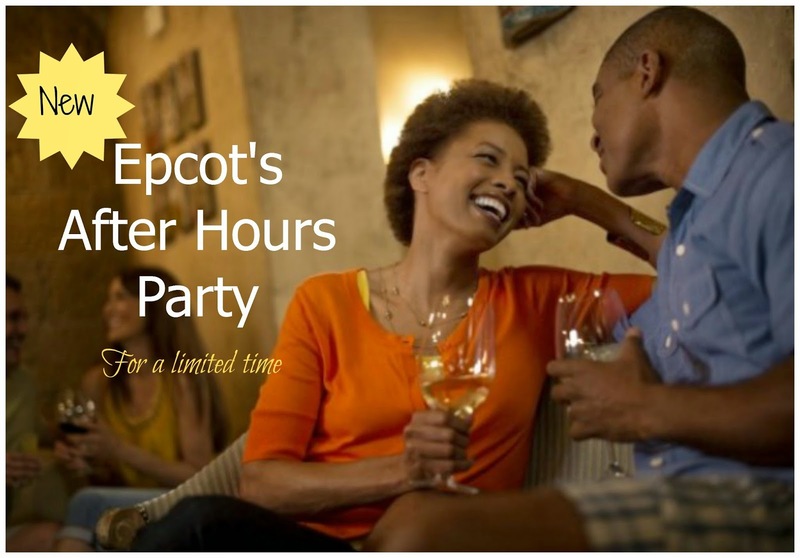 Now Disney has announced a new After Hours Wind Down Party. The party will begin after Illuminations and last till 11pm. It will take place in several of the lounges around World showcase, so you'll have your pick of where you want to relax and unwind for the evening. Will it be La Cava del Tequila in Mexico or Rose & Crown Pub in United Kingdom? How about Spice Road Table in Morocco or Tutto Gusto Wine Cellar in Italy? It will be a tough choice, but your ticket only gives you exclusive access to one of them. Once you are inside the lounge of your choice, you will be treated to cuisine created by award winning Epcot Chefs and Sommeliers. The menu will include small bites paired with beverage flights. I'm not sure how "small" they are because it is noted that additional beverages will be available for purchase. Have you ever been to an exclusive event at Disney? What was it? Why Not Take the Medal? 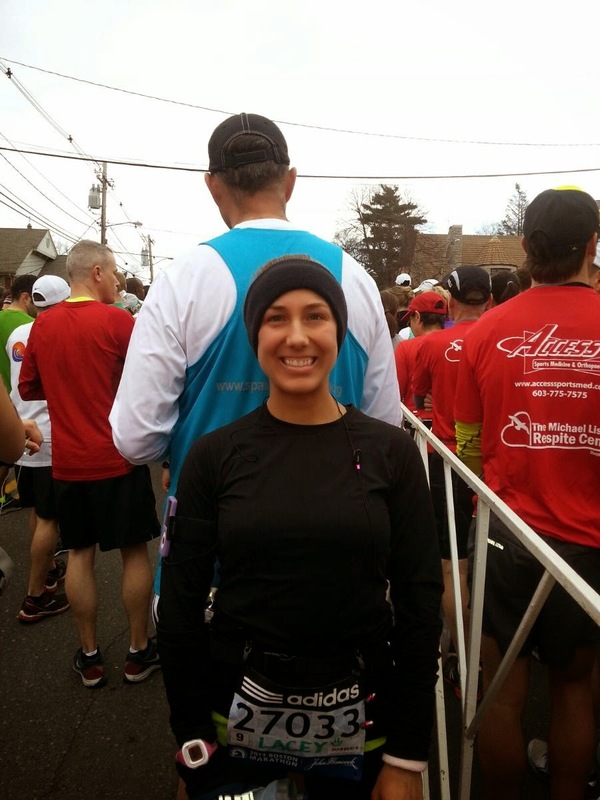 Being a volunteer at any race gives you a different perspective on the whole race experience. Especially if it is a race you haven't ran before. It is amazing, especially when you get to be at the finish line. You get to see runner's experiencing so many emotions as they cross that finish line. Some are crying, some are fist pumping, some are high fiving everyone in sight, and some are just trying to make those last couple steps across. Regardless how they come across the finish line, they've done it! They have accomplished something to be proud of! 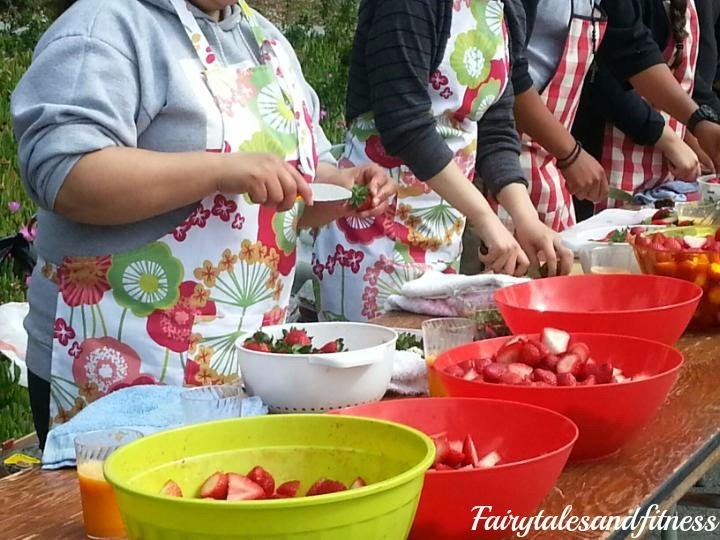 The premise of this post was inspired by our friend Patty that blogs at My No Guilt Life. She had recently posted a picture of the Donald half marathon medal and we were discussing the design of the medal and what we liked and what we didn't really like, but in the end, it's a medal, it symbolizes an accomplishment so no matter what it looks like, we'll take it! This brings me back to our volunteer experience. 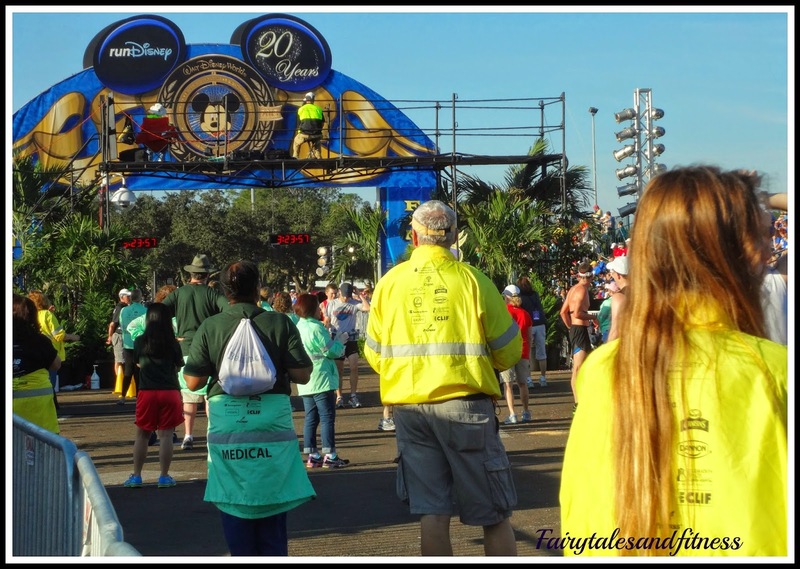 While we were volunteering for the Donald Half Marathon last year, we were fortunate enough to see those runner's cross the finish line as we handed out the lovely Donald medals! There was one runner in particular that I won't forget. Let me preface this by saying that no matter when you cross the finish line, it is an accomplishment. And should be something to be remembered by. Anyway, this one runner comes crosses and walks down the chute where we are handing out medals. I try to give him a medal and he declined. it. Okay, I thought maybe he just didn't want the medal from ME. Maybe he had a friend or someone else that was going to give him his medal. I get that, I would be presenting my sister with her marathon medal the following day. But as my sister and I watched this runner, he declined the medal from every single volunteer. Thus leaving the WDW marathon medal-less. This definitely had us wondering, why didn't he want a medal? I know, I know, many of you are thinking "You run the race for yourself, not to get a medal" which we know all to well to be true, but if someone is going to offer you a medal for your accomplishment, why not take it? It didn't cost anything extra. 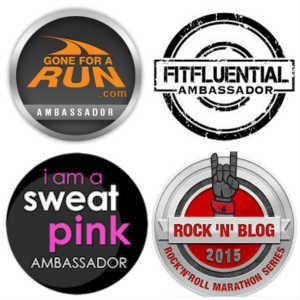 We've recently heard of races charging extra if you wanted a finishers medal. we think this is just wrong. Maybe this runner has way too many medals as it is, and he didn't know what he would do with one more. Maybe he wasn't proud of his time and felt he didn't deserve it ( although he did cross very early in the race, I think anyone would have been happy with the time he had). The next day I was volunteering at the Marathon and as I was waiting for my sister to cross the finish line, I noticed this guy who had crossed. As he walked by, he tore off his bib and threw it in the trash can right beside me. I couldn't believe it. 1. Was that really the first thing you want to do as soon as you cross the finish line of a marathon, tear off your bib number. I guess he won't be getting any post race pictures taken from Marathon photo because they will not be able to identify him now. 2. Don't you keep that kind of stuff? Even if you don't keep bibs from other races, wouldn't it be nice to keep the one from a Disney race. It was Disney, it was a marathon, and it was the 20th anniversary. In my mind, that was a big deal. I definitely would have kept the bib. My sister kept hers. Again, I thought maybe this was a race that he didn't want to remember. He finished in less than 4 hours, so of course I thought he made good time. Maybe he didn't agree! In any case, what we may find as abnormal race day behavior, my be another persons norm. Just thought we would share a bit of what we've done last week and add a few fun pictures. 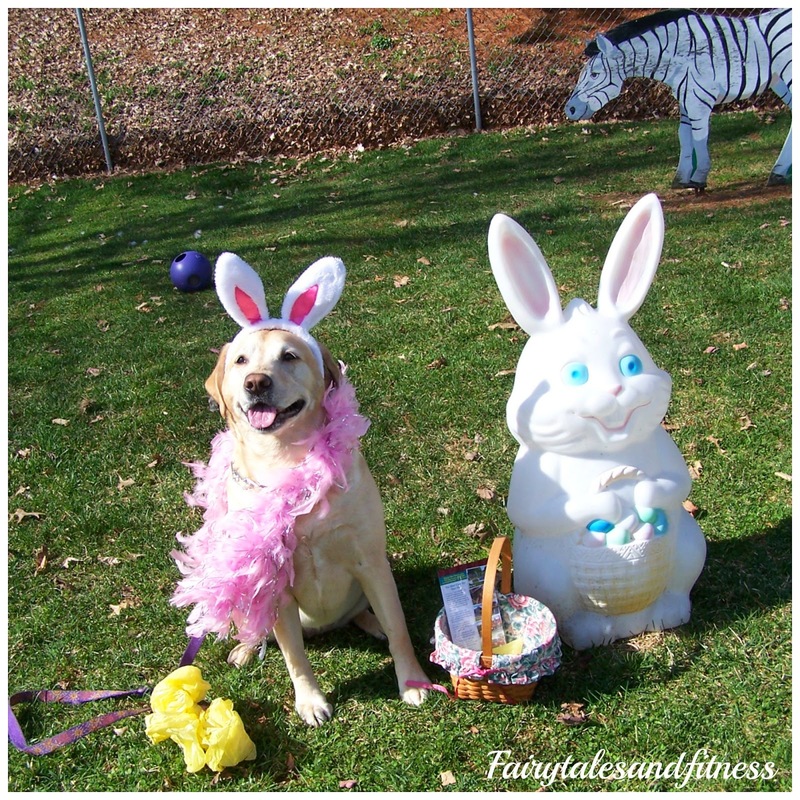 Miss Bell participated in an Easter bone hunt for dogs. She didn't find many bones but she sure looked cute, don't ya think? Miss Baylee did not go to the bone hunt. 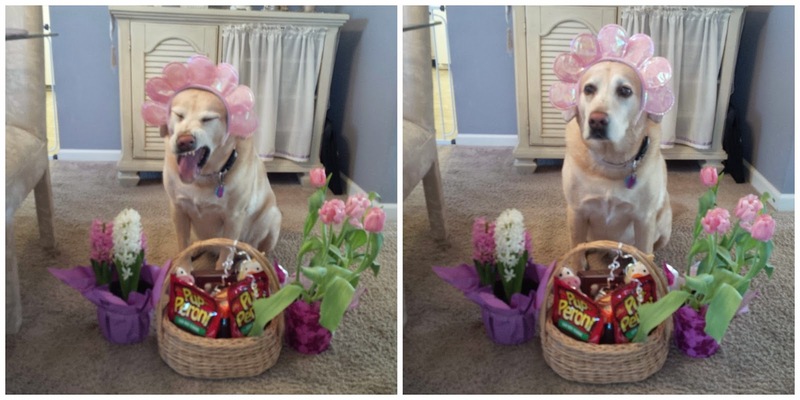 She apparently didn't appreciate her Easter Basket either. But than she decided to be more grateful and let me take a nice photo...haha We love our dogs! Meranda: Took Baylee for a 2 mile run/walk around the island near our home. This is what we saw when we got there. 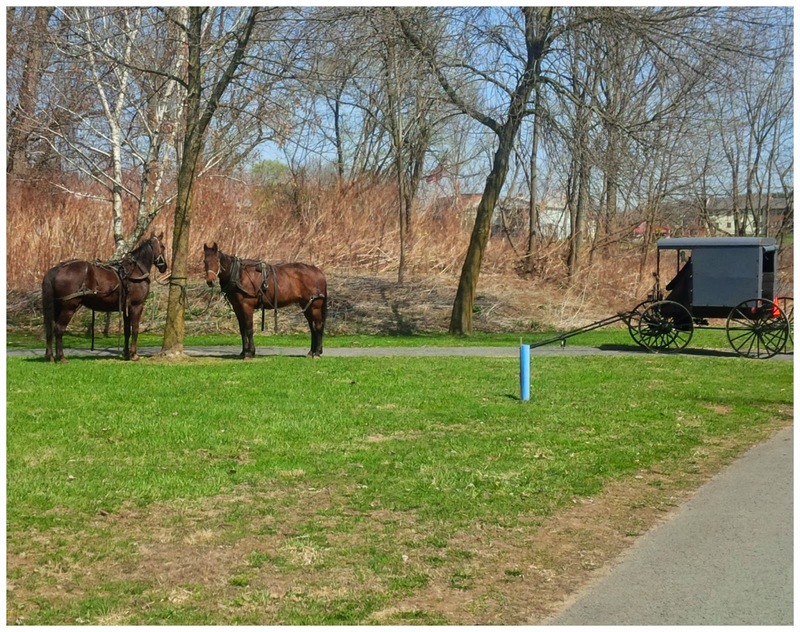 I have never ever seen horses or an Amish buggy ( this was one of two buggies that were there) at this park before. There aren't even any Amish Communities in our town and I'm thinking it was probably quite dangerous for them to travel here. They would have had to taken a major highway! In any case, they were blocking the trail so Baylee and I had to find an alternative route. Lacey: Worked an overnight flight. Meranda: Took Baylee back to the island and was very unhappy to find 6 ( large) piles of horse droppings on the trail. I clean up after my dogs, I think people should have to clean up after their horses. It's only right, don't you think? Our run/walk got rained out anyway. Meranda: We went back to the park again. This time we went with a friend that has a Labrador puppy. It was much fun watching Baylee and the puppy run around freely and play. Meranda: I honestly can't remember what I did on Thursday. I guess Just worked a little but nothing too exciting. Lacey: Long Flight to California. The good thing is, I gained a few hours once I got there. Meranda: I'm trying to take Baylee to the trail to run as much as she can. She really needs to lose some winter weight and prepare for swimming season! We did our almost 2 miles. I had another PT appointment this day and he finally told me that he has done all he could to help me. I know need to seek the help of yet another professional. Oka, so I've gone through 2 health professionals so far and I am not any better. 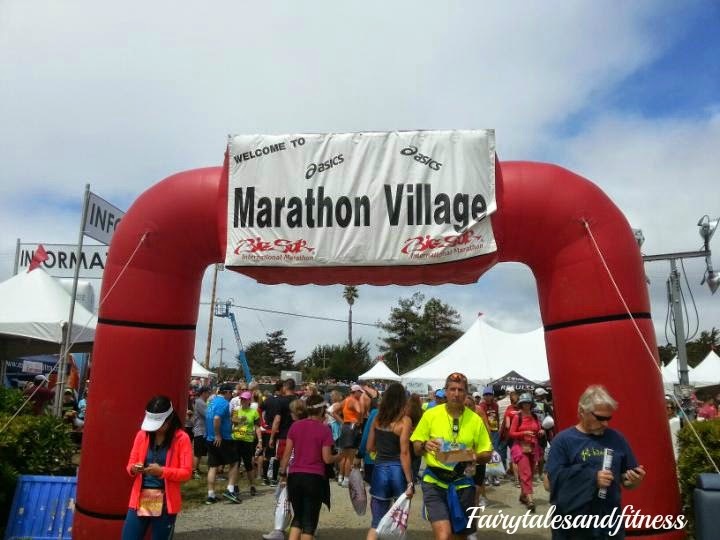 Lacey: I spent the day at the Big Sur Expo. Met some great vendors and got to try some new products. I can't wait to tell you guys all about it. Meranda: We had an Arts festival in town and I had to go take pictures . What a beautiful day it was. I saw this doggy in the window, so Scott bought it for me for my upcoming birthday. I have a friend named Miranda too, and she had some girls over for a girls night later that evening. ironically enough I met another gal who had ran the Disney half marathon last year. I told her I was there volunteering and that I may have given her her medal. Small world! Lacey: I went back to the Expo and this time listened to the speaker series. Later that evening I went to the Pasta Party. Did you do anything interesting this past week? What are you looking forward to in the week to come? So by now, everyone knows that the Avengers Super Heroes Half marathon Weekend at Disneyland is sold out, right? Do you know anyone that so desperately wanted to go but couldn’t get in because of the fast sell out? 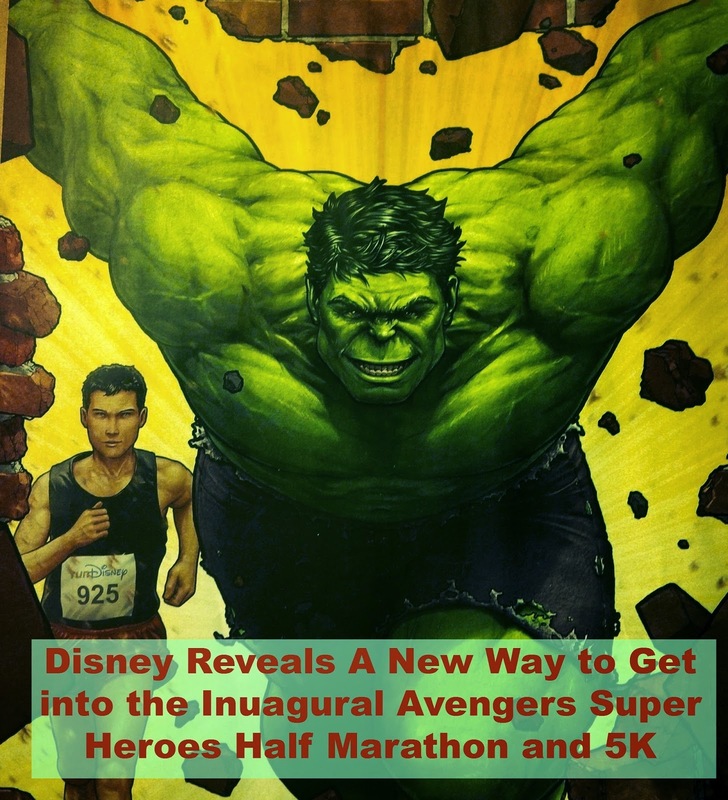 Well Disney has now put together a package that includes access to the inaugural Avengers Super Heroes Half Marathon weekend. This means you get to participate in the 5K and the half marathon. The package is through Adventures by Disney. It not only includes access to both Avenger Super Heroes races, but also two pre-race group training runs through the iconic Southern California areas. You will also get an exclusive behind the scenes tour of the Walt Disney Studios and a visit to Walt’s private apartment inside the Disneyland Park. Now that’s pretty cool. Since this is an Adventures by Disney trip, all the other details would be taken care of for you as well. Accommodations and most meals are included. This is a 6 night package from November 10 through the 16th. I think it sounds like a pretty neat deal if you’ve never been to Southern California before or if you really want to participate in the inaugural Avengers Super Heroes Half marathon. Unfortunately neither my sister nor myself are interested in the Avengers, so we really have no desire to do this race ( and also, we are doing RnR Vegas this weekend ). But if you are interest in more details, let me know. I am a part time Travel Planner for Disney and I can give you more details and hook you up. Will you or someone you know be participating in this weekend? 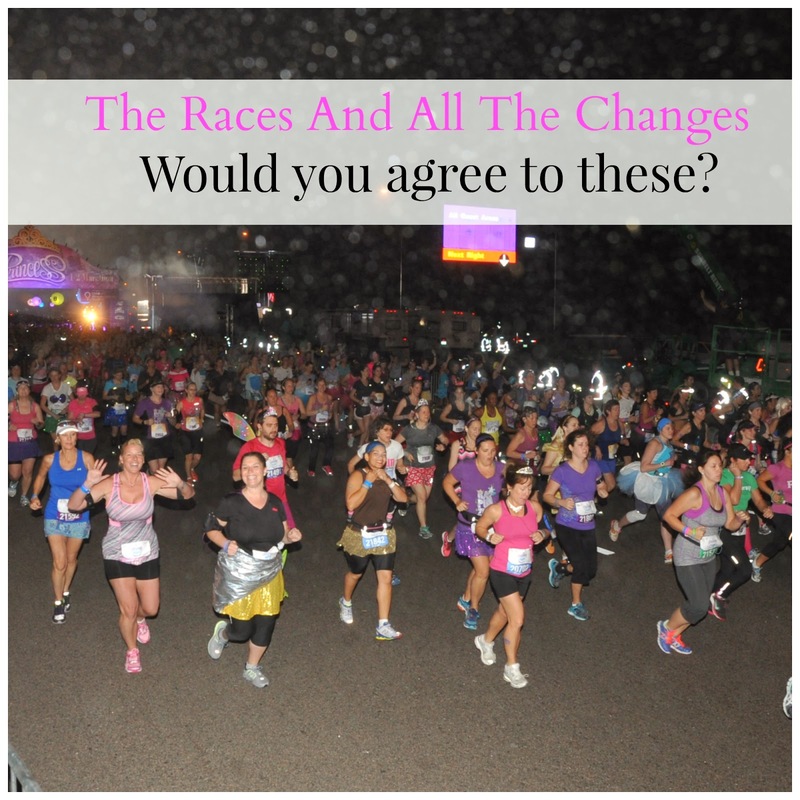 Races: Would you agree to these changes? Since it's Friday, we're linking this Friday 5 post up with Courtney from Eat Pray Run DC. We didn't quite understand the theme this week, so I am sure we are probably a bit off topic, but it will be fun. We haven't run many races that we've been disappointed in, but there are a lot of things that we've wondered about. If it was up to us, these are just a few of the changes we would make. 1. Have you ever ran a race series that offered a set of challenges? The Disney Glass Slipper? The Dopey? The Goofy? The Runner's World Hat Trick? J and A's Dolphin or Whale? Well, these "challenge" races are great. One weekend, multiple races, lots of bling. If you are participating in a "challenge" inevitably you will be taking it easy on some races and maybe "racing" just one of them, or maybe you need to take it easy on all of them just to get through them ( that would be me). One thing we would like to see done differently with these challenges are the order in which the races are ran. Wouldn't it be great to get the marathons and half marathons done first so you can really do your best, and then do the 5k's and 10K's on the days afterwards so you can just run to have fun? For Glass slipper challenge I would love to run the half on Friday, 10K on Saturday, and 5K on Sunday! Also, along the same line with the challenges: So at Disney if you do the half and the full marathons it is called the Goofy Challenge and you get that third medal. What about the folks who are just starting out in their running career and want to do both the 5K and the 10K? Shouldn't there be a challenge for those folks too? Should they have the opportunity for a third medal for their accomplishments? Those who are completing the Dopey challenge might not think running a 5K and 10K back to back is anything spectacular compared to what they are enduring with their challenge, but for someone just starting out as a runner, it IS a big deal. And hey, Disney could make more money off of it, right? You would think they would like that! 2. Registration is another thing we would like to change. 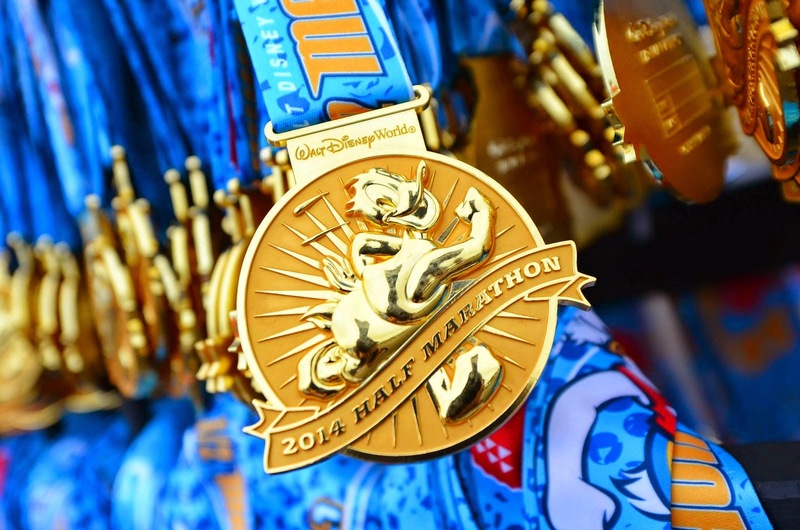 As many of you know, Registration for the Disney World marathon opened this month. Unless you are pregnant, who in the world knows exactly what you will be doing 9 months from now? Life happens, things change, but if you want even a chance of running a race that is a sure sell out, you need to register. We would love to see the statistics on how many people register for Disney races but end up not being able to race. Yes, you may defer ( for a price) but there are no refunds. This is another great way for Disney ( and other races) to make more money. I wonder if they count on this? 3. Can we get a little something extra for finishing? This is something we actually talked about in a previous post but it fits here too! Since many races give medals to all the runners, a gesture of something a little extra for those who cross the finish line would not be too much to ask. Disney could easily give all finishers a free park pass. They would make more money in the long run because people would be spending money once they got inside the park ( and would also have to purchase a park ticket for their spouse or travel partner if they are not running). If a park ticket is a no go, how about giving a voucher for a free breakfast somewhere on property? That could be easily doable. 4. We get that going to the race expo is all part of the experience of participating in a large race. We have been lucky enough to attend all the race expos in plenty of time, but with Disney increasing the amount of races on their schedule it is making it increasingly more difficult for people to get to the race expo a day earlier. For example, those running the Dopey Challenge will need to make sure they are on Disney property by Wednesday so they can get to the expo and get their race packets! Wouldn't it be nice if there was a designated resort ( or 2) on Disney property that had after hours packet pick up? Lets say the expo closes at 8pm. The designated resort could have late night packet pick up each night from 8pm-2am. Just a thought. 5. And one last thing, the merchandise. When will these races start planning accordingly. If you don't get to the expo the first day it opens, you can assume that a certain shirt or jacket in your size aren't going to be there. Things sell out too quickly. I'm not just talking about Disney here either. I heard the Boston Marathon jackets were sold out in certain sizes at the expo this week. Maybe it wouldn't be a bad idea for all larger races to have a Pre-order section. ( I know that some do already). Case in point, my sister and I decided to go ahead and pre-order the Disney marathon jackets when we registered this week. This was a very gutsy move on our part because we have NO IDEA what they look like. We've NEVER done anything like this before. We normally want to know exactly what we are getting for our money. Part of me wonders if this item IS going to be available at the expo, because if it is, we could have gotten 10% off by using our Disney visas to purchase it. But since we are not doing the Dopey Challenge, ( meaning we are not going to be there on the first day of the expo) chances are that the jackets will be sold out by the time we get there. So I guess we just bought an $80 grab bag from Disney and it will be a surprise to both of us! So what do you think of the changes we would like to see made? Would you be on board with any of these? What changes would you make? I Missed the Plane, Now What? 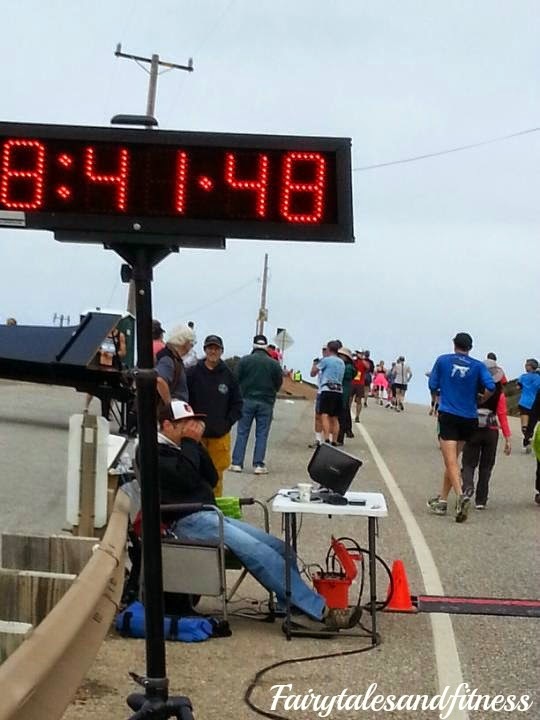 As many of you know, I am registered for the Big Sur Marathon in California this weekend. That's right, I got my virtual goody bag in my e-mail the other day, and somewhere in a convention center in Monterey is a bib with my name on it and a race shirt in a size small that was ordered just for me. And I'm sure there is a medal ( or ceramic medallion) waiting for me too. The only problem is, I won't be there to receive any of this. You guessed it, I made the decision to say good bye to my sister Lacey as she set off on this adventure with out me! Believe me, this was a HARD decision to make. Those of you have who have been regular readers know that I have been struggling for sometime now with IT band issues and severe hip pain. Even after going to Physical Therapy for an extended period of time, I still didn't think I was prepared to tackle the hills of Big Sur. So now you know why my sister's post sounded so somber yesterday. She is quite sad to be going on this journey on her own. 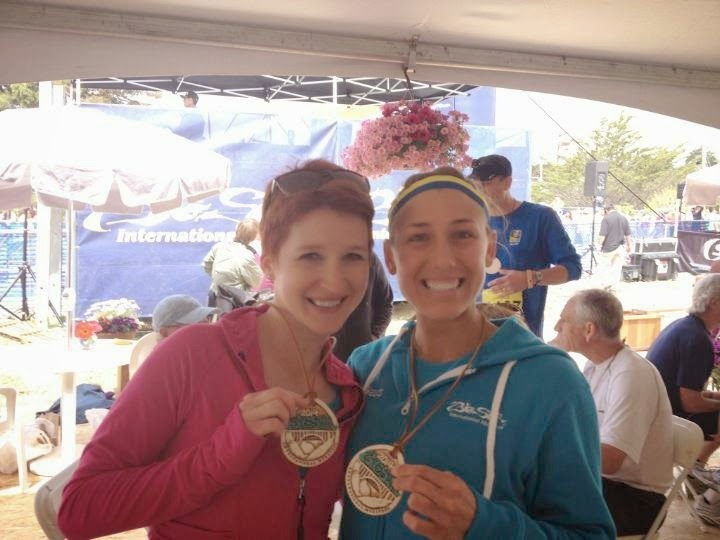 She had already conquered The Big Sur Marathon once, so I'm pretty sure doing it again this time was all for my benefit. But I have to believe she will be fine and that I made the right decision to sit this one out. Needless to say my dreams of becoming a marathoner will not be coming true in 2014. So now what? Although I am bummed out, I can't stay sad for too long because I need to continually work on building strength and coming back even stronger because we do have a lot to look forward to. Mickey's Haunted Trail Run 5K : Already registered. And I actually got my husband to sign up and run this one too. He may actually make an appearance on the blog! His name is Scott and he could definitely use some encouragement! Tower of Terror 10 Miler: Already registered. This will be my first night time race. Rock n Roll Las Vegas: Already registered. This is actually a family event and I am so excited. My mom and dad will be running this with us! 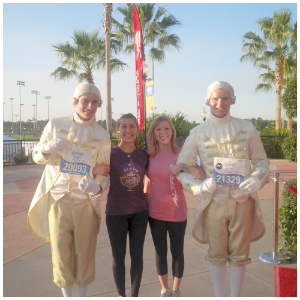 Disney World Marathon and Half Marathon : Yup, my sister and I are going Goofy! We kept thinking why not throw in an additional 5k and 10k but honestly it's not the distance that gets us, it's all those early mornings and the additional days we would need to be there. Right now neither one of us can confidently dedicate that many days away, especially when we have other races we want to do. But you can bet we've already started thinking of race outfit ideas! Glass Slipper Challenge: Not signed up yet, but hoping to. Tinkerbelle: We are thrilled that this race is in May next year. This will be the first time for either of us to participate! And who knows, maybe I'll try for Big Sur in 2015, but if we do, that will make for a very busy Spring, so I don't know. 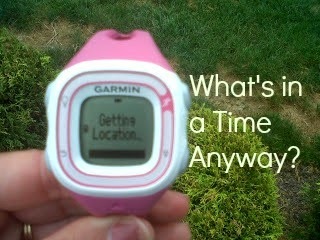 What's on your race schedule for the rest of the year? Will we be seeing you at any of these races? P.S I don't advertise this often, but I am a part time Travel Planner for Disney. Room rates are out now for Marathon weekend and if you would like me to help book your room for you, it would be my pleasure to do so! It doesn't cost you anything extra, and if a better rate comes out several months down the road, I will let you know about it ( something the reservation line won't do). It's here, it's finally here! Tomorrow I will be on my way to Big Sur California! For those of you who don't know, Big Sur is part of the B2B challenge ( Boston 2 Big Sur). Last year I was so excited to go out to California to run the Big Sur Marathon after running Boston to complete this challenge. Even though I didn't run Boston again this year, I am heading out to Big Sur again for round two but with slightly different feelings. I remember running the course last year and saying to myself well I can check this off my bucket list for a one and done. I didn't have a desire to come back. Although the scenery was beautiful it was by far the hardest course I had ever run. How could this be when I even ran Boston? But when registration opened for 2014, my feelings changed. Like many other races if you don't sign up the day it opens (like the disney challenges), you miss out. I remember talking my sister into going out with me to run it. She agreed. I thought to myself well maybe it won't be so bad this time because we can conquer the hills together. But more importantly we would be doing it for the experience. So I began to get excited about this race again. I had already committed to the Shamrock full marathon in March and I knew that would be the race I would try and run for time, since I'd be running by myself. 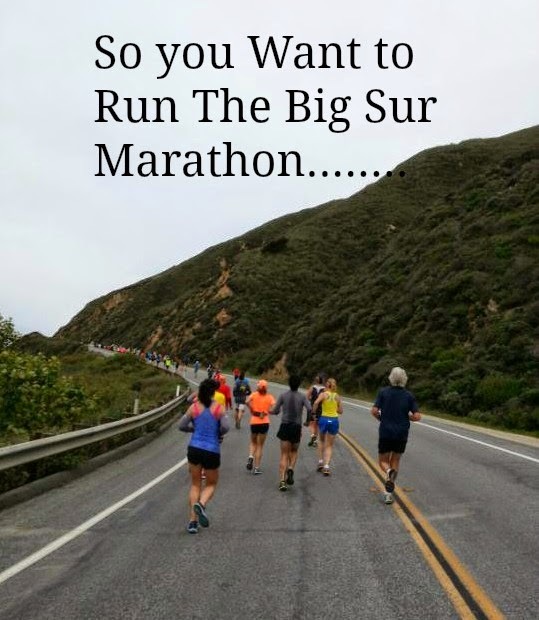 The Big Sur would be more relaxed and no pressure running with my sister. Since then, things have changed and I'm beginning to think that those hill sound like too much now and a part of me thought I don't even know if I want to do this again. Maybe I'm just being lazy, I don't know. So now, like the Shamrock I will be running this race by myself. What do I do? Do I race it and see if I can beat my time from last year?(3:51). Or do I just enjoy the scenary and the race itself and still not worry about time. I feel like you are the only one that puts pressure on yourself. Because I'm running by myself, I think "I better do well". But at the end of the day does it really matter what the heck my time is? It's not like I'm going to win. I feel as if my only goal is to just enjoy myself. If you put too much pressure on yourself it definitly takes the fun out of it. And isn't that why we all do it? So here I am AGAIN, talking about time ( I know, I know). If I beat my time from last year, great! If not, I'm sure it'll be within miniutes and that's just fine by me. For me it's consistency. Yup, it's salad time! When the weather is warm, there is nothing better than a big ol salad! One of my favorite things about salads is that you can't mess them up! 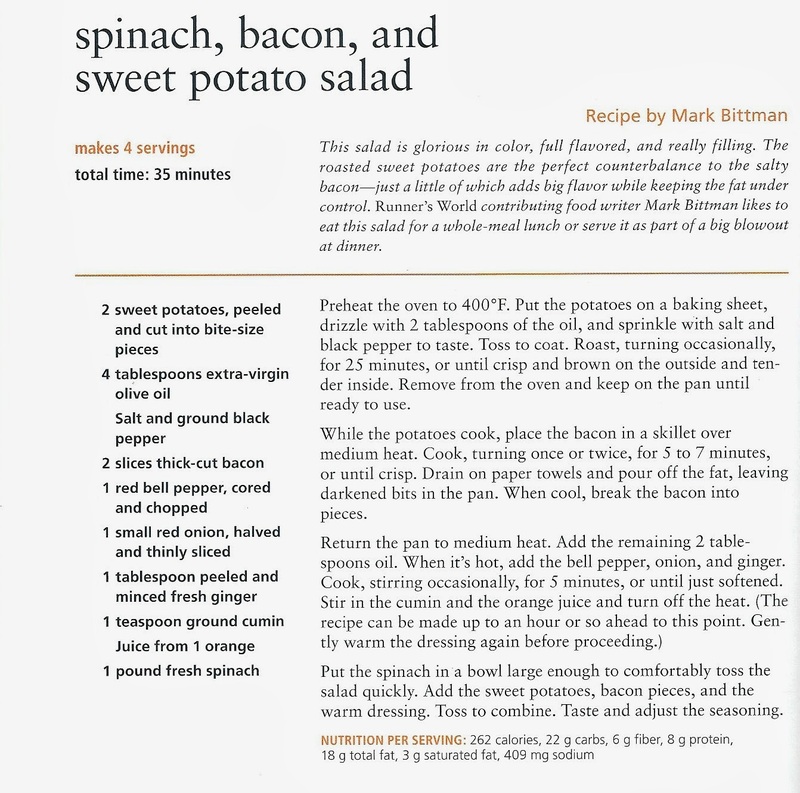 in actuality, I usually end up making my own salad recipes out of my head. I don't really have a recipe, but they are just certain ingredients that I have found go well together. 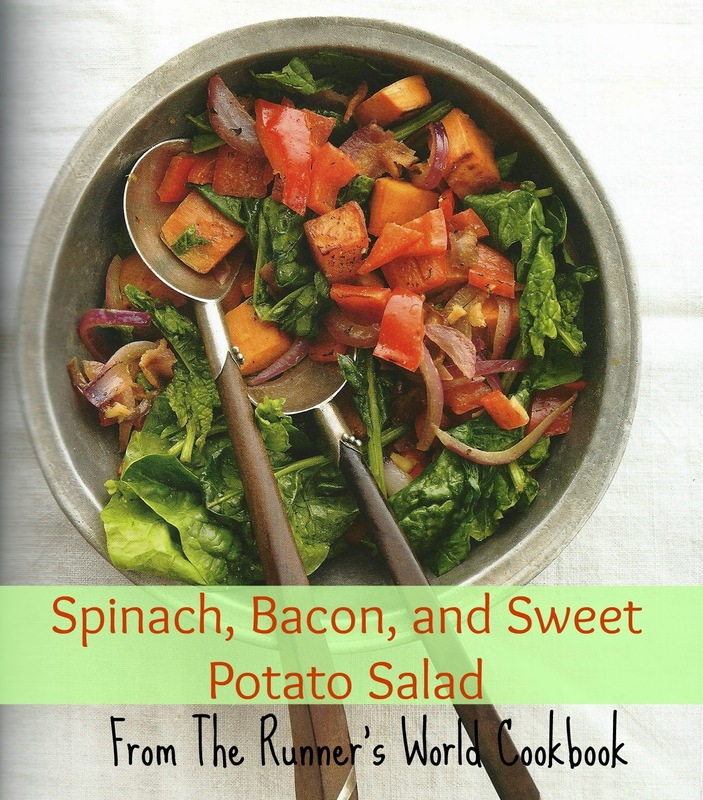 I should share some of them sometime, but for now, I'm going to share this recipe for Spinach, bacon, and sweet potato salad from the Runner's World cook book. And like I said, you don't have to follow the recipe to the tee. Just use the same ingredients and you get the idea, right? Enjoy! What's your favorite kind of salad? Do you ever just make up your own salad? If so, what ingredients do you add that wouldn't be in your normal salad? Don't forget to link up your favorite tasty post today! We are co-hosting this with Lean Lena. Make sure to check her out as well! Congrats to all the runners in the Boston Marathon today! I can imagine all the excitement for the runners and their families to be a part of one of the greatest races in the country. I was fortunate to be able to run in it last year and experience it for myself. This race by far was always on my bucket list (as I'm sure it is for every runner). People train their whole running career just to be able to run their dream race here. I couldn't believe that I was actually fortunate enough to be here. I was at the starting line of the Boston Marathon and it was a dream come true! At the start of the race I told myself I wasn't trying to go for time since I knew it was a hard course. I didn't want to have to stress out about anything but to just enjoy myself and experience the Marathon. And that is just what I did! I have never been to a race that had so many cheering spectators along the sidelines during the ENTIRE race! This gave me much motivation when the going got tough during the course. There were even children high fiving you and giving out Swedish fish and gummy bears. Who could pass that up? I finished the race feeling a sense of accomplishment. I was now able to check one more (big thing) off of my bucket list! Just after receiving my medal for completing the Boston marathon. This is when we heard the first bomb. I noticed from this picture that the smoke had started to form in the background. I no sooner got through the finish line chute and that's when I heard the first bomb that went off. My friend and I had no idea what had happened. We took a quick picture and headed back to the hotel to find out the extent of the tragedy that had just occurred. My sense of pride quickly changed to a sense of sorrow. My friend said it best when he said "What a tragedy for many when it should have been a triumph for all". I couldn't agree more. 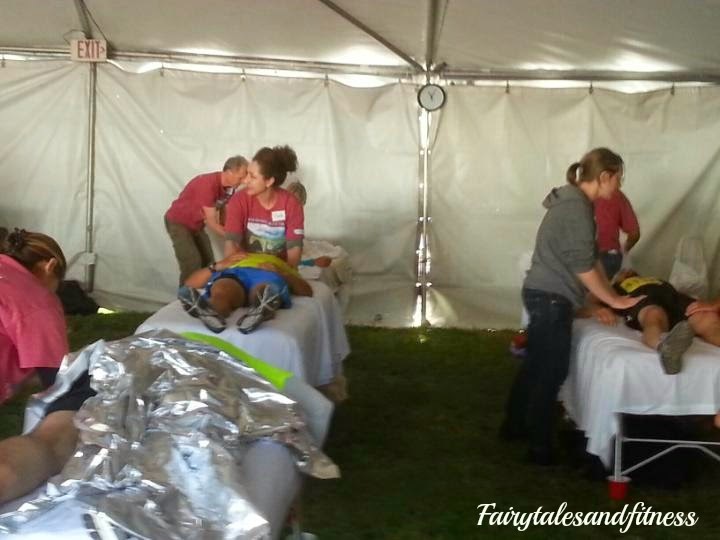 The finish line experience was much different than the starting line experience. Congrats to everyone running the Boston Marathon today! We hope everyone has a fantastic journey and a safe finish! Do you know anyone running Boston today? Labels: Boston Marathon, Boston marathon start line. So what's in a time anyway? When most people set running goals, it's mostly about wanting to get their time down and setting a new PR. We're both gonna talk a little bit about our thoughts on racing for time. 3. One of our favorite running books is Running Like Girl by Alexadra Heminsly. In the book she makes this statement ""Why should I be trying sooo hard to get twenty minutes faster? What's the purpose? What would I ever do with that extra twenty minutes?" But maybe you've found out, 20 minutes can mean the difference between having post race food and not having any post race food left by the time you finish. At Disney races, 20 minutes can mean the difference between getting a pictures with your favorite Disney Character or not, ( or waiting for that character and having a secondary one come out to replace him or her). 20 minutes can also mean the difference between getting a post race massage, and just missing the tent as it closes up shop. 4.There has been a lot of talk around the interweb lately with people saying "I didn't run this race to "race" it". And that's ok! Sometimes we have "off" days, sometimes we are running with a friend or family member who doesn't run at our pace so we run with them just for the experience of running together, and then there are times where we just wan to take in the scenery and just have fun like at a Disney race! 5. And just for fun, we want to tell a quick story about our friend David. David ran the Jacksonville Bank Marathon without a GPS or any other timing device. He said he wanted to just run on how he felt. He must have felt pretty good not having that "worry" about his time because he ended up qualifying for Boston with that race. Good job David! So what are your thought on time? Do your running goals often include improving your time? Thanks to Courtney and the gals for hosting the Friday Five link up where the theme this week is goals. Live with Kelly and Michael is holding a Top Fitness Instructor contest. 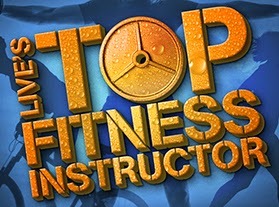 (I absolutely adore this show and try to watch it every chance I get) You can nominate your favorite fitness instructor or trainer and you have to tell why they are so fabulous and what makes their training program unique! You can even nominate yourself too if you think you are fabulous! There is no rule against. They said so! Five finalist will be chosen and will be invited to LIVE to show their fitness routine to Kelly and Michael AND they will be featured in an issue of Fitness Magazine! Isn't that cool? I would love to see one of you guys in Fitness magazine! Let us know if you are a fitness instructor. Who would you enter? Better yet, what would you do with an additional $10,000? If you read our blog regularly, than you know that we like to display the medals we've earned. What's even more fun is when we can do it creatively. Do you remember the photo medal display that I made for my sister a while back? I was starting to run out of room on my own medal display, so I was considering making one of those for myself because I really wanted to be able to display some of our fun race pictures along with the medals. But then, the nice people at Gone For A Run, that company that sells all sorts of really cool products for runners, asked me if I would be willing to review one of their products. 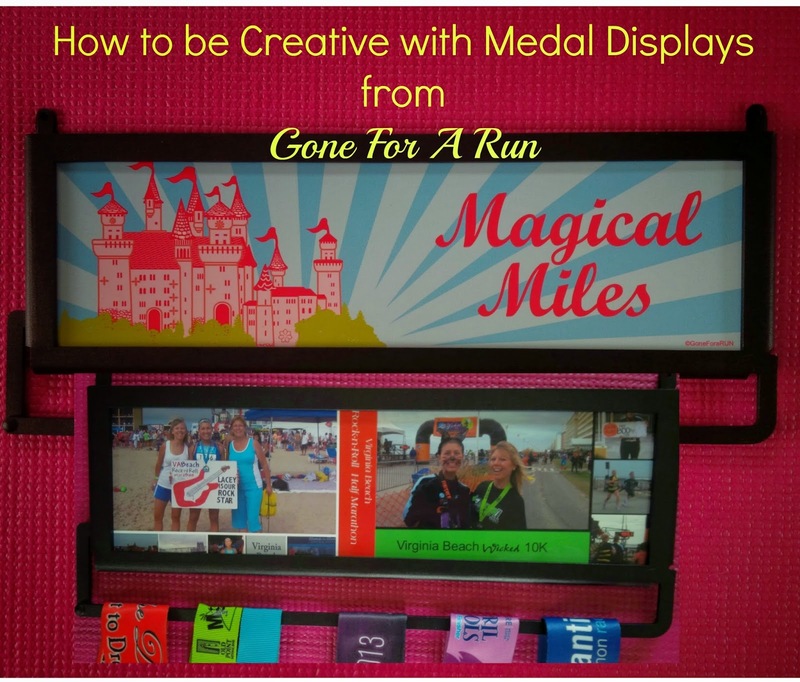 I was thrilled when I received this Magical Miles medal display, and let me tell you why! 2. Very durable! Some medal displays are not as durable. My mother has a display and as of right now she can only display her Disney 5K medals on it because hanging more than 2 "medal" ones on it starts to bend it. That is certainly not the case with this one. I have 7 medals on in it in this picture but I could actually fit a few more on! 3. This great latch allows you to smoothly slide your medals on and off the rod. Once it is snapped into place, your medals are secure and will not fall off. 5. Probably my favorite part about this display is that it allows me to put my own pictures in it. This is of course something that I discovered on my own! The Magical Miles panel actually slides out from the top. Since there is an opening to slide it out, I can of course slide other images in. That panel is the same size as two 4x6 photographs. There is enough room that I can keep the Magical Miles panel in AND slide my photographs in right in front of it. Chances are I'm not ever going to find a display large enough to hold all my medals, so I will always need more than one way of displaying them. So say I want to keep all my Disney medals on one display and all my "beach" medals on another display. I just change the picture on the front of the display and Ta Da! I am done! I love how versatile this is! Gone For a Run has a ton of other Medal displays that you will fall in love with. They even have many that they will personalize for you! Wouldn't that be cool to have you name or your favorite saying on your medal display? If you are looking for a way to display your medals, you should definitely go check them out. If you ordered a display from Gone For A Run, what would you want it to say, or what pictures would you use on it? 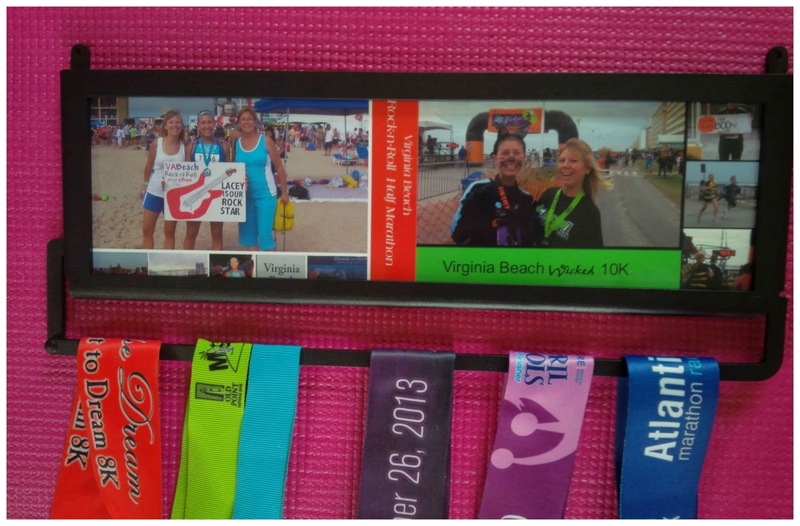 * I received this medal display from Gone For a Run at no cost to me, but I truly do love this product and all opinions expressed here are mine! We normally don't go back and re-read a post that we've already published ( unless it's to fix a typo, and I'm sure we've missed a few of those over the year), but recently I've been finding that going back through our blog to be very helpful. It lets me remember details of an event I may have forgotten about and when I went to Physical Therapy for the first time I had to write down when I started feeling my symptoms. I could not recall when my pain started, so I looked on the blog to see when I first started complaining about it, I mean "Mentioned" it! There is one particular day/event that I probably will never forget the details of because it was one of the most emotional days I've ever experienced. If you've read our blog from day one, then you may already know what I am about to say, but considering what time of year it is, I thought it was worth resurfacing. America was certainly shocked when they heard the news of the Boston Marathon bombing on April 15, 2013. I cried. My sister was there running. The day I found out that my sister was going to be running in the Boston Marathon, I promptly got online and starting asking advice about hotels. My sister got her notice that she would be able to run the marathon only a few weeks before, so we didn’t exactly have a lot of time to prepare. Either myself or someone in my family (usually my mom) has been to every one of her races and I wasn’t about to miss what could potentially be the biggest race of her life. So I booked two nights at a hotel in Boston. I spent the rest of the week deciphering how I was going to get to all the weekend events (while using public transportation). What train would I use to get to the expo? How would I meet her at the pasta party? Which train was running on race day? How early would I have to leave the hotel? Would I get lost? How would I meet up with her after the race? Would I be okay driving the 380 miles to Massachusetts all by myself? I was starting to feel anxiety. This was not like watching a race in Disney, or VA Beach (where she usually runs). I had never been to Boston. This was an unfamiliar city to me and I felt like I didn’t have enough time to do all the research I needed to feel comfortable navigating myself around. After finding out that the train I would need (I think it was part of the green line) would not be operating on race day, I decided I couldn’t do this. I cancelled the hotel at the last minute. I felt confident that my sister would be okay. She would be meeting up with some race friends and she could stay with them. They would make sure she got to where she needed to be, and quite frankly I thought that I may just be a burden to her as I tagged along. I didn’t want her to have to worry about me. I can’t believe that one split second decision could have potentially saved my life. Watching my sister race is a big deal to me and I always luck out and get a great spot near the finish line to watch her. I don’t know that I would have been in danger, but I know for a fact that I would have been on Boylston Street and I would have been near the finish line holding my sign for her! So with blinds pulled open, the sun shining in, and a yellow Labrador sitting on my lap, I watched the race on TV that April afternoon. I watched what little coverage they provided on the Universal Sports channel ( after the elite runners finish, they don’t show the average runners, so I turned it off and went about my business) I got the automatic text saying that my sister Lacey crossed the finish line (in many races, you can sign up for runner tracking. Each runner wears a tracking chip on their bib. As they cross the finish line it sends a text to your phone giving you the time they finished). She didn’t actually text me herself, but I knew she had finished. I did text her phone saying “Congrats! 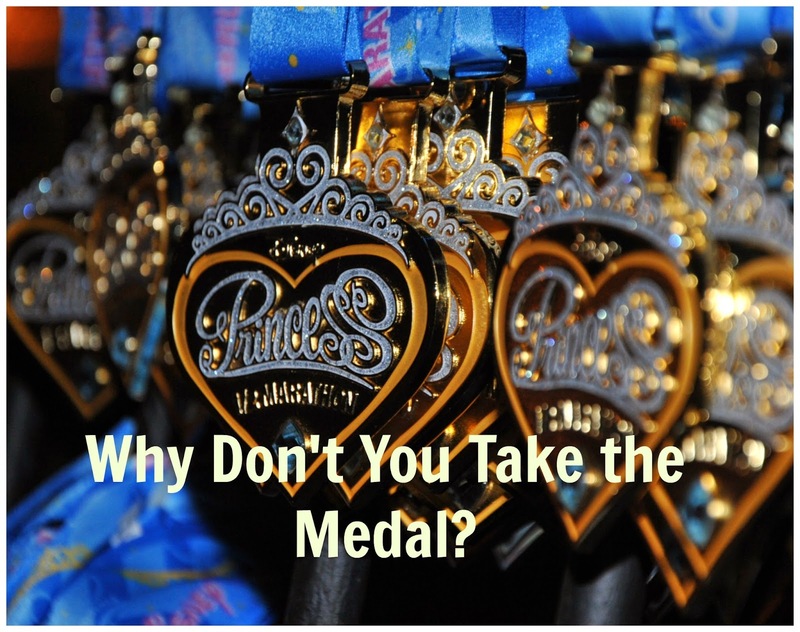 You even beat your Disney World marathon time!” I then got a call from a number I didn’t recognize. It was Lacey. She said she just wanted to tell me she was ok. I could tell by her voice that something was very wrong. I said “what?” I had no idea what she was talking about at the time. She then told me about the explosion at the finish line; it was bad, people had lost limbs, and people died. I just started crying and then turned on the TV to see what was going on. I continued to cry. I then had to call my mom at work and tell her what had happened before she saw it on the news and started panicking herself. Even though I told her my sister was okay, I could tell that my mom was an emotional mess. And my dad, well, it was the first day of trout season so he was off fishing and had no clue what was happening. I was scared for my sister. I am extremely grateful that she crossed the finish line when she did. Only by the help of God she was able to exceed her expected finish time. She crossed exactly six minutes before the first explosion. She had just got her medal and was in line getting Gatorade and water when it happened. I was SO Glad that my sister was okay, but I could have potentially loss my sister the same day I loss my grandma ( she died April 15 exactly 5 years ago to the day). During all this, our home phone started ringing off the hook with people calling to see if Lacey was running and if she was okay. From my brief conversation with my sister, I knew she was going straight to the airport (or at least going to try to get there) I was now concerned about her safety even at the airport. My heart was breaking for her as she had to experience all this and to everyone else that was there and of course to all the victims and their family. My sister has a stressful enough job as a flight attendant and has to worry about this kind of situation affecting her safety on a daily basis. But now it is affecting the thing she loves to do for fun, running! What is this world coming to? She finally did make it home on a very late flight Monday night. As I waited in the airport with flowers and balloons for my sister, an older lady asked what the occasion was and with a teary eye, I told her that I was just happy that my sister was alive and that she made it home safely from the Boston Marathon. She then told her friends, who then told their husbands. So by the time Lacey entered the terminal even complete strangers were clapping for her and hugging her. It was quite an emotional night! 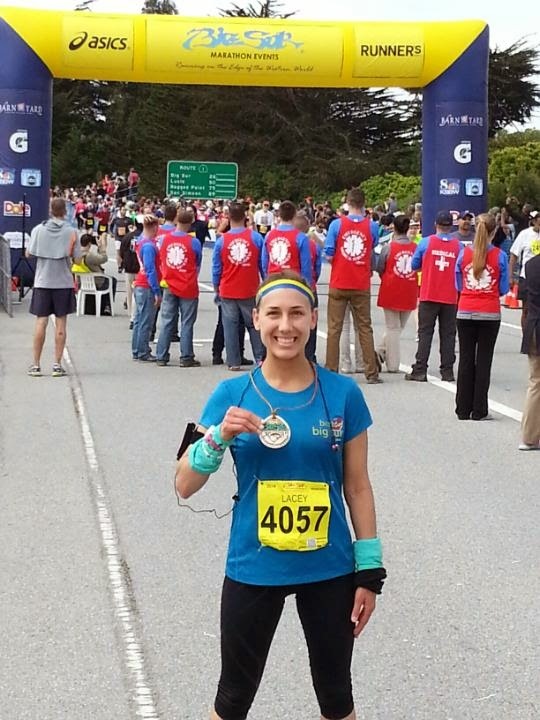 Thirteen days later, Lacey flew to California to complete the second half of the Boston to Big Sur Challenge. Two races, Two Coast, thirteen days apart. I was even more frightened for her safety there. I had visions of something going wrong on that big bridge. Thank goodness everything turned out okay. 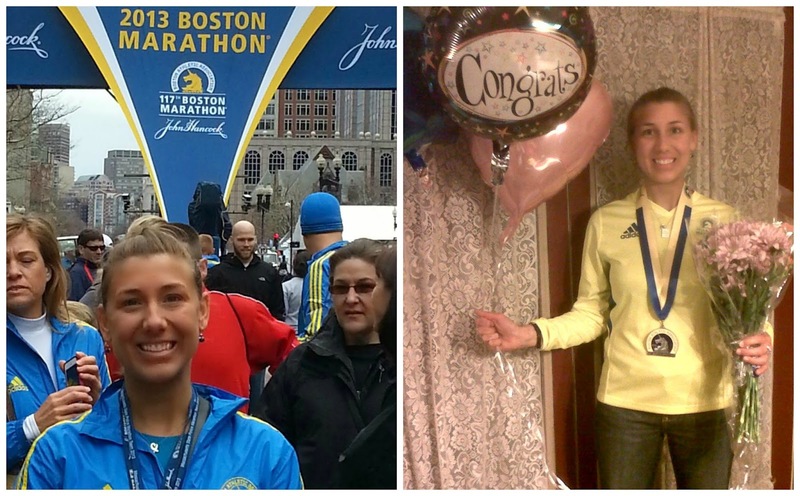 Although she has no desire to run the Boston Marathon again anytime soon, Lacey continued to run 6 more marathons. 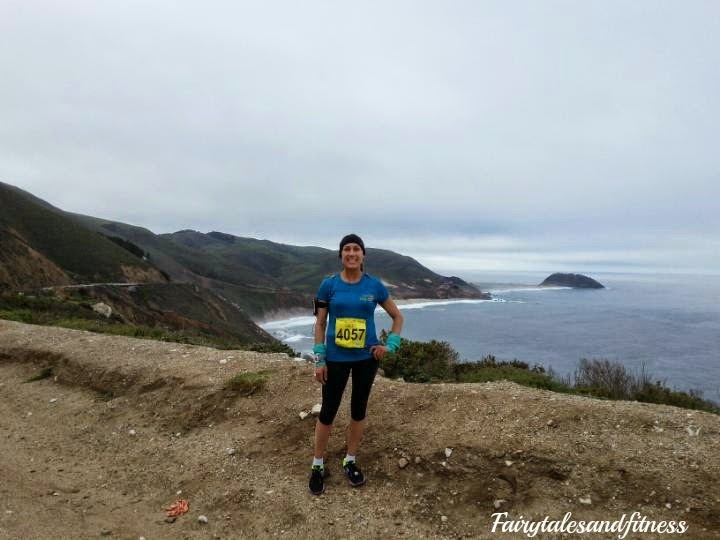 Her 7th will be the Big Sur Marathon later this month. 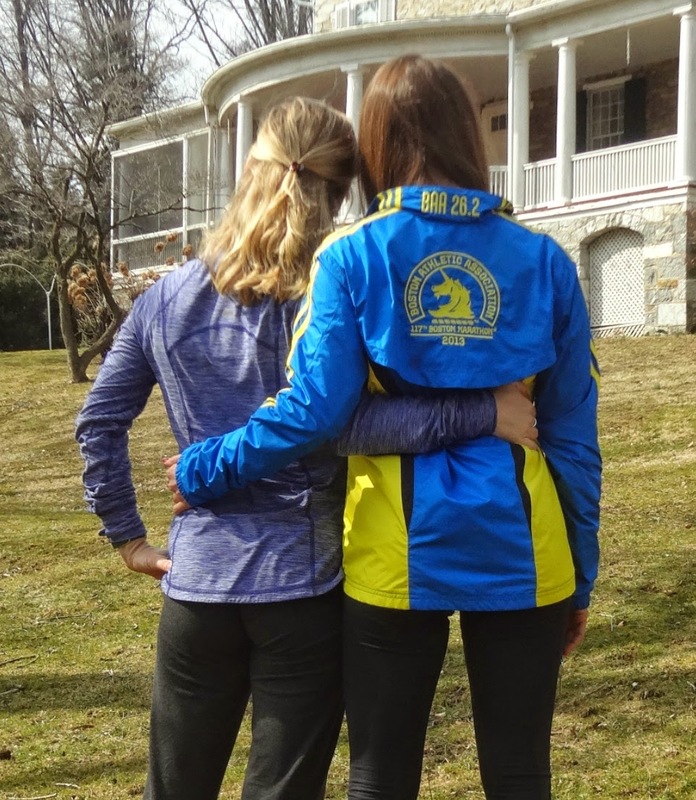 If you'd like to read Lacey's Boston marathon recap from race day, you can read it HERE. Do you ever go back and re-read memories from your blog? Will you be watching the Boston marathon on TV this year? Even though yesterday I got up and made pancakes for us for breakfast, I don't usually make a "cooked" breakfast during the week. Those are what weekends are for! During the weekends we are more likely to experiment a bit more and try to make new things. 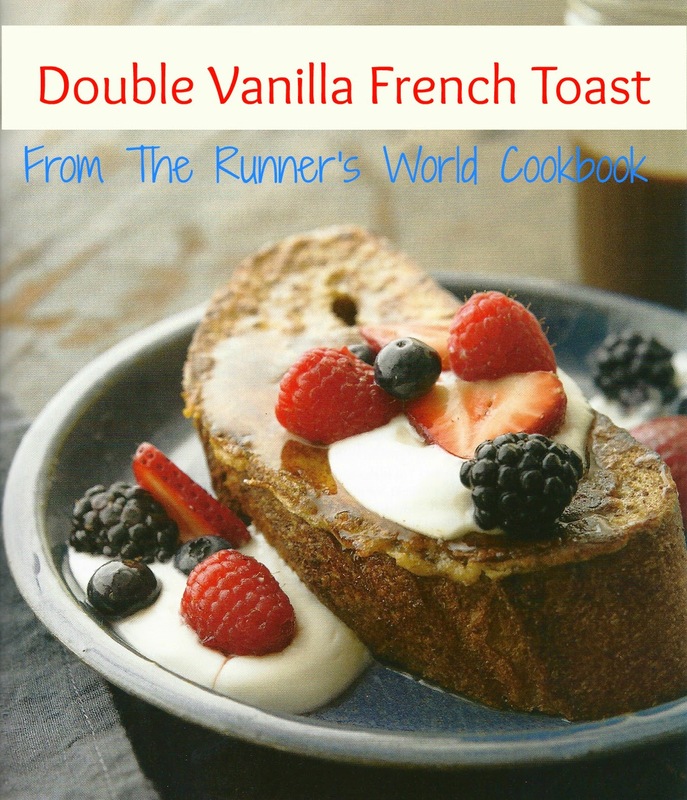 I like this recipe from the Runner's World Cookbook because it calls for ingredients that I normally would already have in my pantry/fridge. I don't buy sourdough bread, so that would be an exception, but I'm sure you could substitute whatever bread you already have. 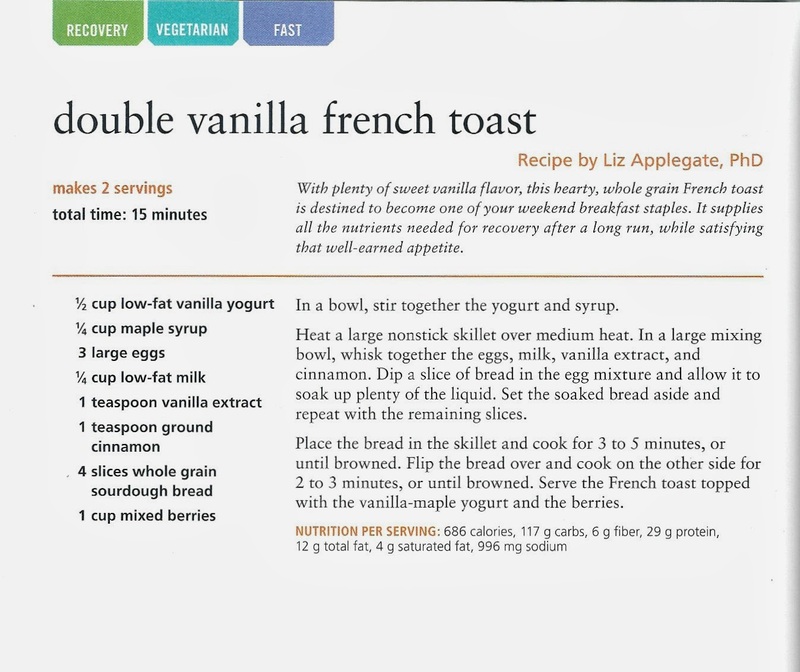 If you think you might want to try this recipe, feel free to hover your mouse over the image and "Pin" it. All of our images on all of our blog posts are actually "Pinnable" as well. And since it's Tuesday, we'll be linking this up with Lean Lena! Feel free to link up your own fabulous food post too, but please give us a comment and let us know you linked up! Thanks! 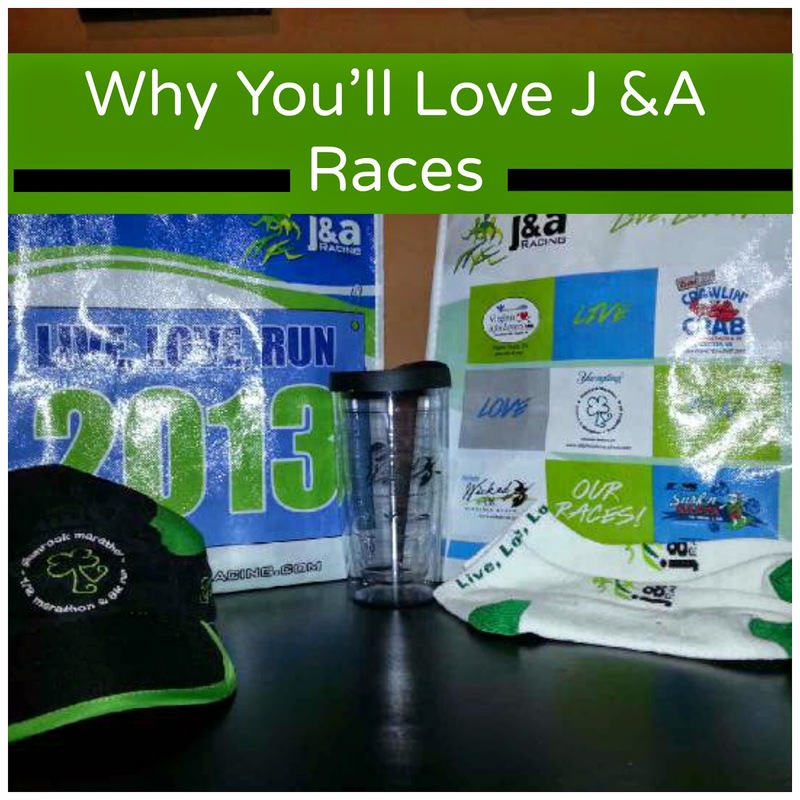 Why You'll Love this Race Series! If you are a frequent reader on our blog you know that we love to travel and run races, so destination races are perfect for us. However, as much as it is nice to travel. It is also nice to do races where you live. It definitely keeps the cost down (flights, hotels, food). I am fortunate to live in an area where there is a great race series called J and A racing in the Hampton Roads area in Virginia. They offer many different races. No matter what type of runner you are, you will be able to find one that meets your fitness goal. Not only is the cost very reasonable, I believe this is the one races series I've run that gives you awesome swag that is included (not just the race shirt). I've gotten tumblers, blankets, wine glasses, hats, etc. Unlike some of the huge destination races that I have been to that have been very costly, you would think they would offer more to the runners. J and A racing is privately owned and was started by a couple about ten years. Before the races there is a decent sized expo, and after the races they even give you food and an alcoholic beverage that is included at a post race party! They currently have 6 race weekends throughout the year. 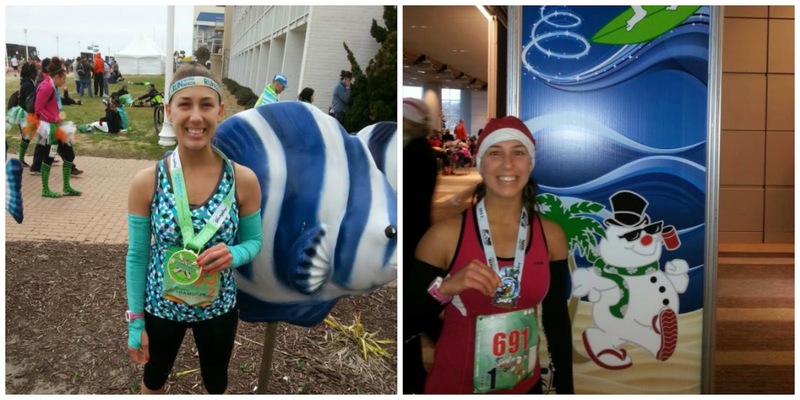 Virginia is for Lovers 14k, Shamrock full and half marathon ( and 8K), Crawlin' Crab half marathon ( and 5K), Wicked 10k (and Monster Mile), and Surf-n-Santa 10 miler( and 5K). And the inaugural ODU Big Blue 5k this spring. In the past I have heard that if you completed all of the J and A races throughout the calendar year, you were able to receive an additional item. So I made this my goal for 2013, and I achieved it! I didn't really think the gift was going to be anything special, however I did it for myself for a personal goal. 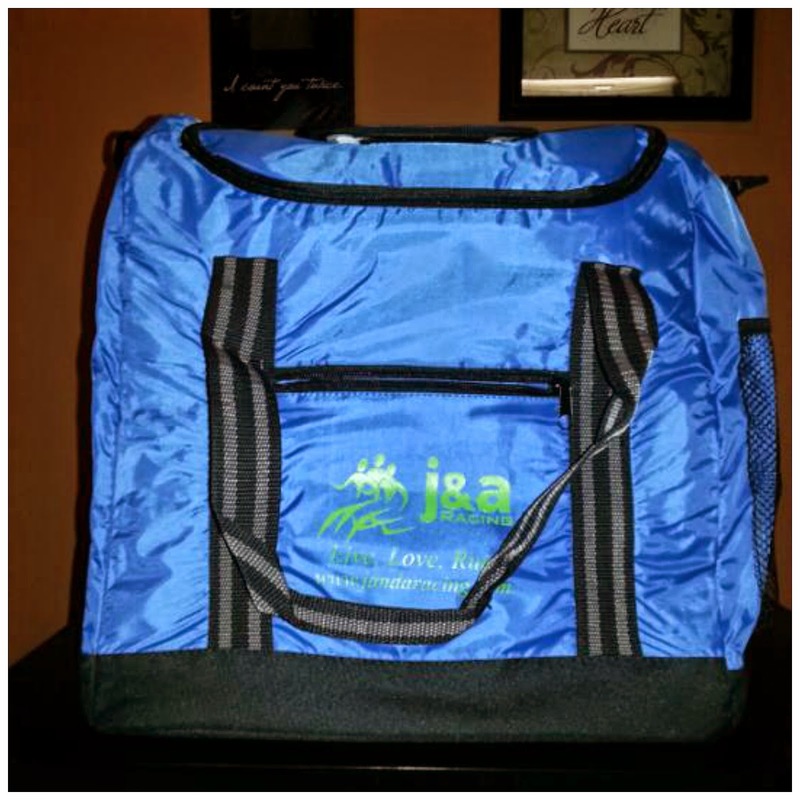 I heard from other runners that you would receive a cooler. I thought to myself all those races you completed and you only get a cooler? I actually saw one of the coolers a friend received the other year that was very small, it was more like a lunch tote. Why not an additional medal? Well I was quite surprised at what I received in the mail the other week. It was a cooler, but not a small one by any means. It was a huge cooler that will be perfect for those beach days! I was very happy with my gift I received. Even though I did not receive an additional medal, I began thinking at least I got something that I will actually be able to use and will come in handy this summer. So thank you J and A racing! If you are ever in the Hampton Road Areas you should definitely sign up for a J and A race. You will not be disappointed. Thank you to Jerry and Amy Frostick for creating such a great race series! Is there a race series that you've ran all of? Do you have a local race series near your home? 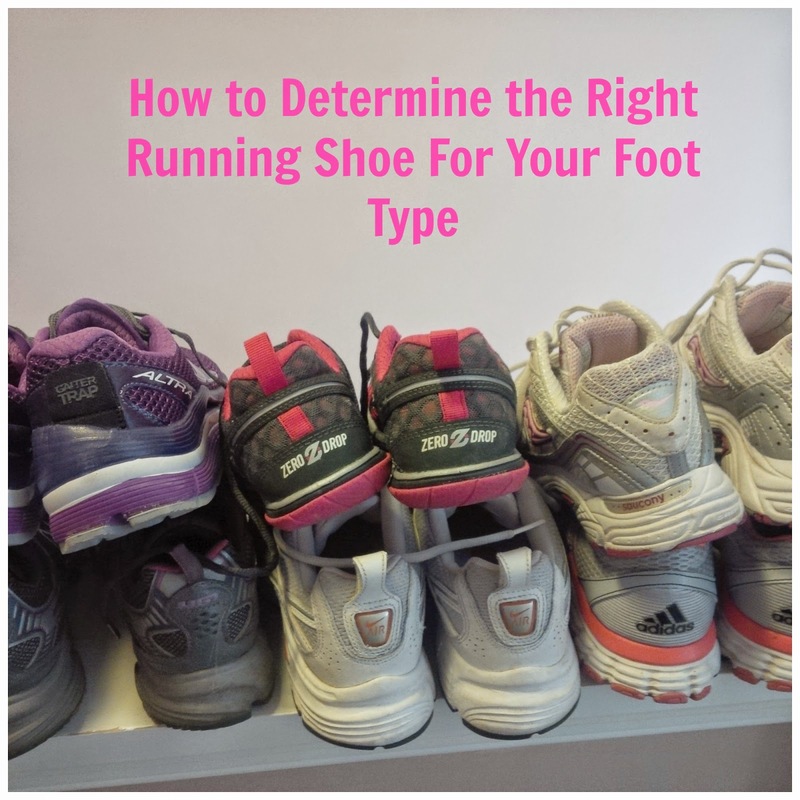 How to Determine the Right Running Shoe For You! 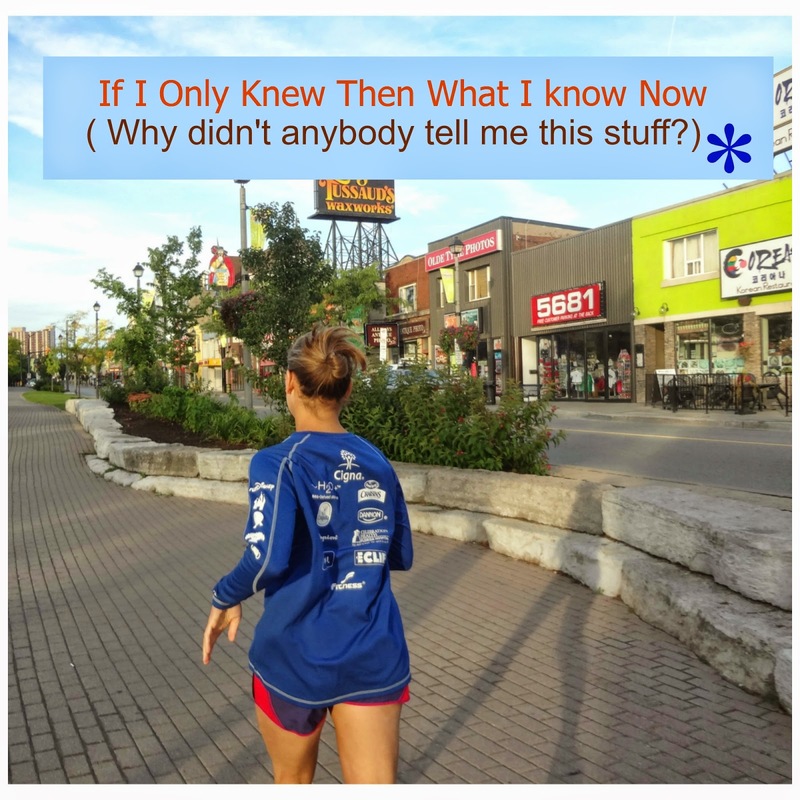 We recently did a post on how to find out whether or not you were a person who needed more or less cushioning in your running shoes. Since there are so many different kind of running shoes out there and there are so many determining factor in deciding which shoes you should get, we decided to put a few more hints out there to make it a bit easier. 1.Determine your size. This may be a no brainer, but the shoe size you have always been wearing may not be the size you should be in. I found this foot guide that you can print off and lay your foot against. For running shoes, I usually buy a half size bigger than what my foot measures. 2.Determine your foot type. 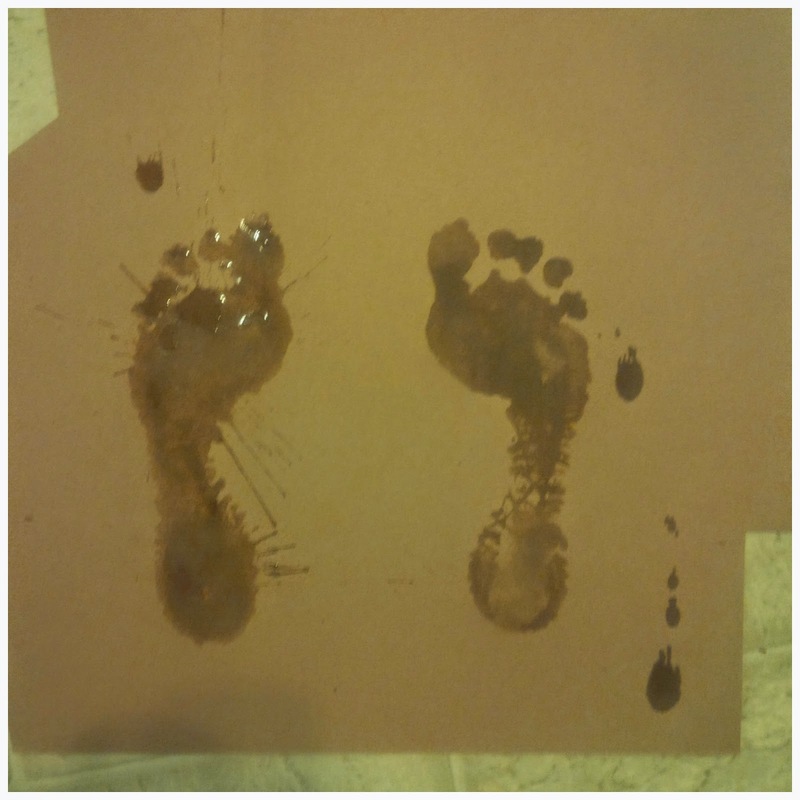 You can do this by getting your foot wet and then making a foot print on a dry piece of paper or on concrete. What shape does your foot make? 3. Compare it to this chart. I would say I'm pretty Neutral. Stability is most important. Find Something that will provide good arch support and prevent your feet from that "rolling" motion. Avoid lots of cushioning. It'll only intensify instability and pronation problems by allowing your feet to continue rolling inward. Cushioning is needed, especially in the heel and forefoot. You'll want something that provides the softest cushioning and the lightest weight. 5. And to think that when 1 first started buying running shoes, I didn't know any of this. I just went by if I liked the color and if it fit! Now I not only worry about if I like the shoe or not, but will it like me back? Will it be a shoe that will improve my form or impede it? Have you done the water test on your feet? What foot type are you? * I'd like to add to this that I did wear my purple Altra Olympus on my 11K race on the boardwalk last weekend and they felt amazing. As some of you remembered, I was having hesitations on keeping these shoes because of all the cushioning they provided, but that cushioning felt amazing after the race when my legs were sore. The only problem is while I am not a heel striker when I run, I did find myself becoming a "Heel Walker" Because there is so much cushioning in that shoe, I would step first on my heel and rock up on my toes just because the cushioning felt so good! The other weekend my sister and I went to a Murder Mystery Weekend and the theme was Back in Time which made us reminisce about things that happened to us in past. 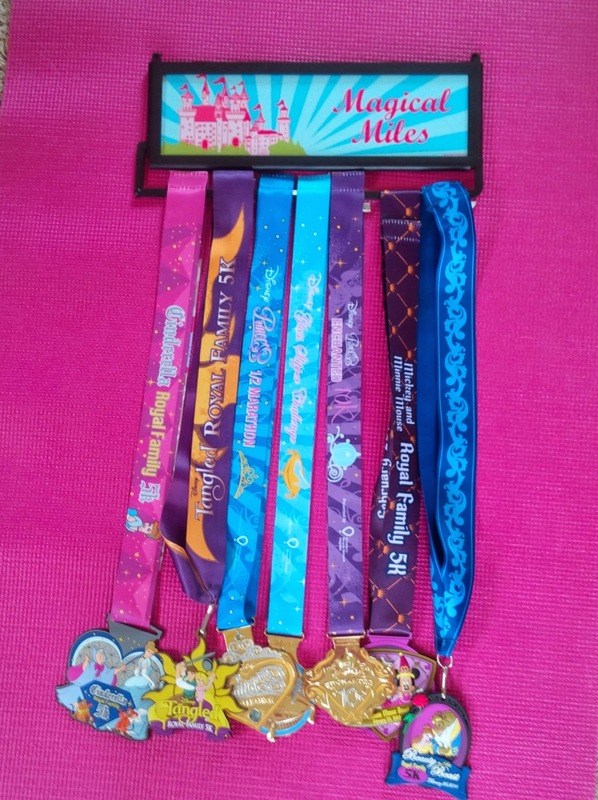 If you are a frequent reader on our blog and have been following us since the beginning you will remember that one of our first blogs we posted was my Disney Princess half marathon in 2012. However, that was not my first half marathon. My first half marathon was the Lehigh Valley in 2007. I never posted anything about this race before, because it was so long ago and I didn't remember much about it. I don't even have a picture of me afterwards! Although I do remember certain things which I will share with you now. I was still living at my parent's house in P.A. working at the airport and one of the ladies I worked with told me she was running it. This would be her first one too. I thought to myself well why couldn't I do this. Now I was a runner is High School, or should I say sprinter. I never thought I would run distance but this was on a bucket list of mine, so I was going to run this! After all I was pretty consistent running my usual 5 mile loop. What's another 8? Now I will admit, I did not train for this (if you've read my other posts about races, I know you're shocked right?) I think the most I did was a 7.5 mile run one time. Not only did I not follow a training plan, I did not train with proper nutrition and fluids during my run. A GU? What the heck is that? The evening before the race I met my friend at her house and she drove us to Lehigh Valley. We went to Panera Bread for dinner because she liked that restaurant. I didn't think anything of the restaurant and why we didn't go to an Italian place for pasta to carb up. After all, the bread that is made for our sandwiches has carbs. I probably got a half sandwich and soup for dinner, because it was cheap. I don't even remember going to an Expo, which I know we had to because we had to pick up our race packet and bib. I guess it wasn't too memorable. The morning of the race I got up in plenty of time to eat breakfast which was a bagel with peanut butter I believe. I didn't have a pre race ritual before my runs so I'm assuming I ate whatever my friend brought us for the morning. I don't even remember what hotel we stayed at, but I do remember it was close enough to the starting line so we did not have to take a shuttle. The race did not start super early like some do, which was another nice addition. The race was in April and we lucked out with a beautiful day without any rain. Now getting to my outfit. I did not train in any specific outfit. Pretty much whatever was clean, I wore. Not only did I run in anything, I wore cotton socks! Apparently no one told me back then that that was a bad idea. So race morning my outfit was a dark green ribbed tank top(aka wife beater) and fleece pants. C'mon fleece pants for a marathon? No one told me that wasn't a good idea. I guess even if my friend was thinking that, it was too late because it was the only outfit I brought. Not only was I wearing that, but both my sports bra and socks were cotton! But I have to say, regardless of my outfit I was wearing, I was comfortable the whole time and did not chafe, nor have blisters on my feet. I guess I really did luck out! During the race, I didn't take any nutrition nor even stop for water. I didn't even run with my ipod. I would not even think about running a race today without my ipod. And yes I did have one back then, but I thought to myself I'd be too busy singing along to it, that I wouldn't be focused on the race. Today, I still find myself singing along to my ipod, but I feel like that gives my the push to continue. I ran the whole time during the race, I thought if I stopped at all, I wouldn't be able to continue running. I finished the race in 2:04 for my first half marathon. Afterwards, I felt good, and proud of my accomplishment, but didn't think I would want to do it ever again! It wasn't until I moved to Virginia the summer of 2011 that I joined a running group and did my next half marathon, which was the Disney Princess 2012. Like said, I didn't even get a picture of myself finishing the race with my medal. I didn't have camera phone back then. 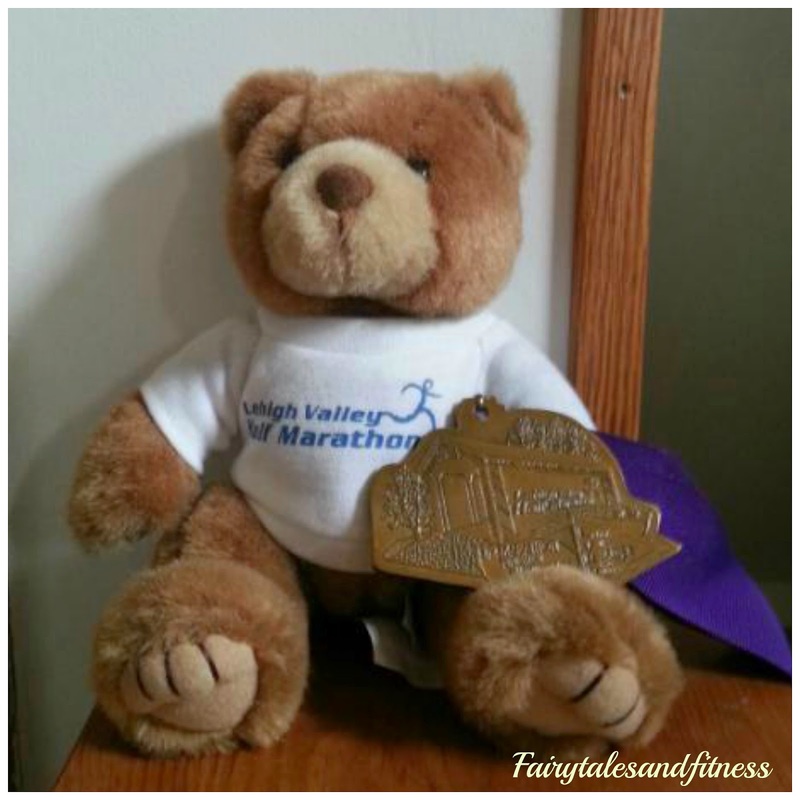 But I still have the bear that all finishers received along with my medal, so that's what I took a picture of recently. After the race, my friend wasn't feeling very well so we left right away. I was hoping to stay and enjoy the festivities. I even saw a tent that was giving free massages! After I saw that, I thought all races offered that at the end. Boy was I wrong! I remember coming home from the race that day and going to my grandparent's house for lunch, which we did every Sunday. I told my family- aunts, uncles, grandparents, cousins of what I did earlier that morning. Now I'm not one to gloat in accomplishments, but felt this was something to be proud of, but it didn't phase anyone. Everyone just said good job. Ok I guess that was it. It's not like I could have posted it on facebook or twitter. Social media was almost non existent for me back then. Even my sister, who I think of as my biggest cheerleader, didn't make a big deal of it. Before I wrote this post I talked to her about that, and she said she really didn't remember. The one person that did understand was my uncle, he had run several marathons, and later qualified for Boston. But unfortunately he became injured while training and never got to attend. So now you know my experience during my first half marathon. You know that saying, If I knew then what I know now? I would have done things a bit different. What experiences have you been through that you think you would have done differently? 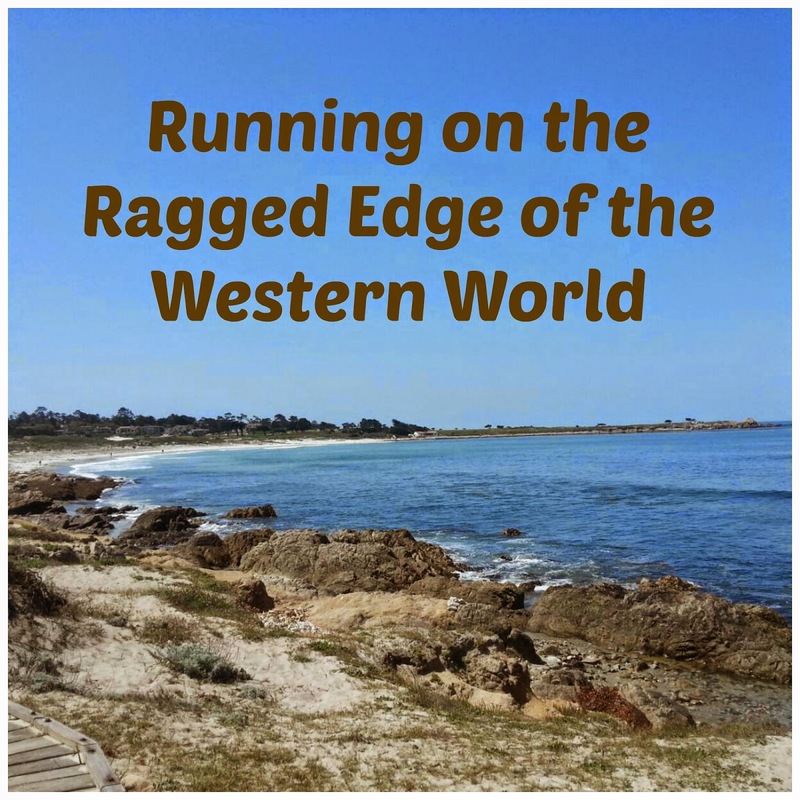 Have you ever heard the phrase "Running on the ragged edge of the western world"? 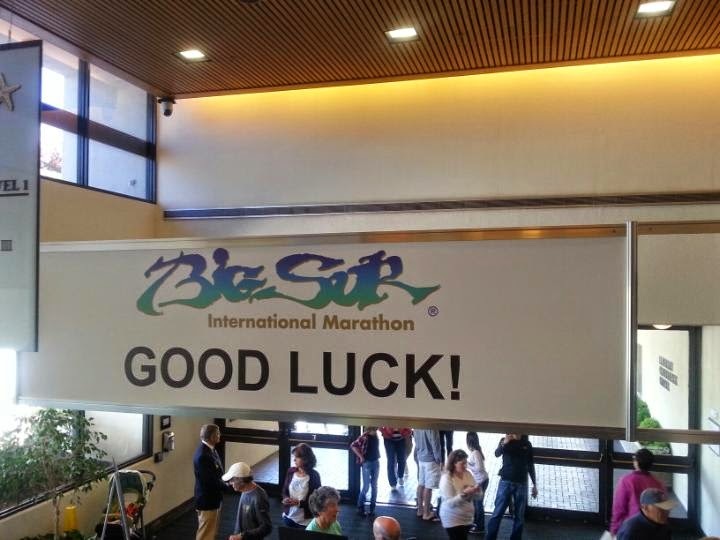 If you have, then you probably know that it is the tag line for the Big Sur International Marathon in California. 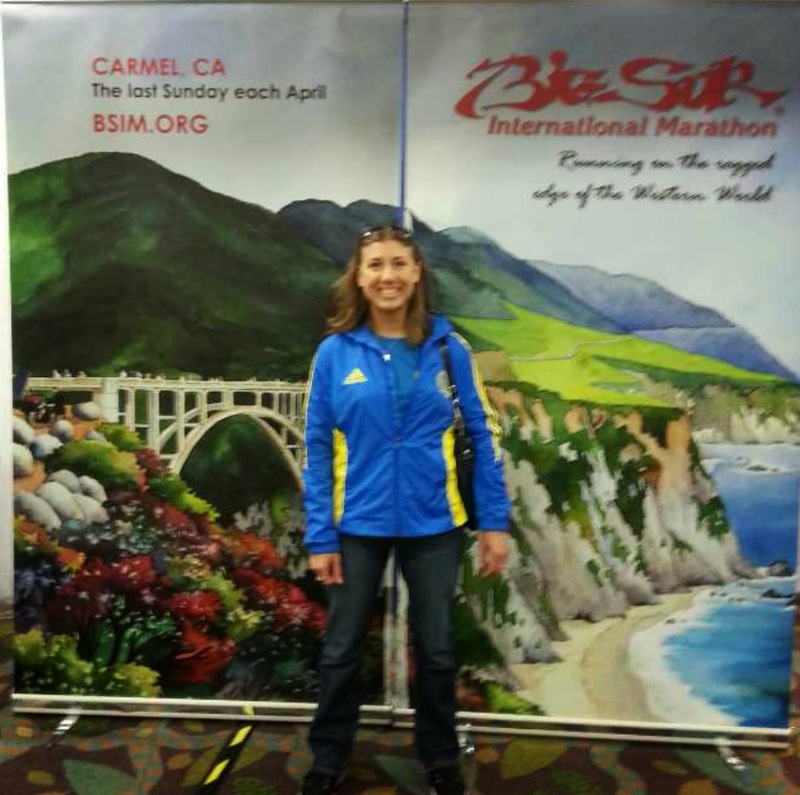 On New Years Eve, I received the exciting news that I had been invited to run the Big Sur Marathon on April 27th. WOW! I could hardly believe it. I was officially registered and I would be running with my sister who ran it last year and it would be a great time. I did have a few hesitations though! 1. I always thought Disney would be my first full marathon. 2. Just thinking about running across the Bixby Bridge makes me nervous. 4. At this point ( January 2014), my longest run has only ever been 13.1 miles. 5. 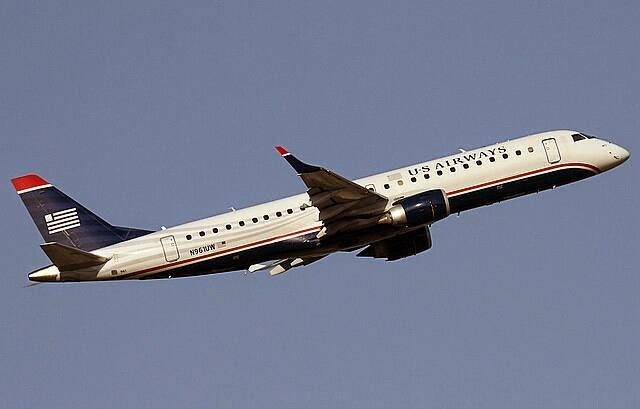 Flying to California makes me nervous ( I do love to travel and fly often, but I certainly don't have the love for it like my sister who is a flight attendant). But all this aside, I'm being pretty positive about the experience for these reasons. 1. My sister had agreed to run with me at MY pace! 2. I'm already in training for a half marathon, I'll just continue my training for a full! 3. The timing is perfect. I don't have anything else planned. BUT THEN.....We all know that this training did not go as planned. After The Princess Half Marathon I was severely injured. I've spent 3 months at the Chiro and in PT. Although I just completed an 11K with little pain, I wouldn't say that I am marathon material yet. So people keep asking me "What are you going to do about Big Sur?". And to be completely honest, I just don't know. Sometimes it's about the journey and not about how fast you can get there so part of me thinks I can still do this with a LOT of walking. And guess what? I just MIGHT be the last one to finish for real this time and I really won't care because it really is just about FINISHING! Of course there is the 21 miler! This race is walker friendly and you have to keep a pace of 18 mm, which I could surely do even if I walked the entire thing! But why would I want to walk/run 21 miles by myself? I know completing 21 miles is an achievement, but I'd hate to do all those miles and not have the satisfaction of completing a marathon. I'd always think to myself "Really, you couldn't do that last 5.2 miles?". There are races of lower distances as well. I often thought that maybe I could do one of those instead but of course there are many thoughts that go along with that as well. 1. Would I even be allowed to change distances ( Remember how well that worked out for me last time?). 2. Do I really want to go all the way to Big Sur and do a "Small-ish" race? 3. Do I really want to go all the way to Big Sur and not even get to run and experience the course with my sister ( which was the plan)? So as you can see this whole running on the ragged edge of the western world has had me asking myself many questions. What do you all think of the situation? The evolution of Crocs: Can they be stylish? What is a Murder Mystery Weekend?